Quick Add is the easiest way to add transformers, readers, and writers to the workspace. To try it, click on a blank area on the workspace canvas and press a key on the keyboard. For example, type the letter a. When you press the key, a dialog appears on the canvas that contains a list of transformers whose names begin with a number or the letter a. Press the Return key, and the highlighted transformer appears in the workspace. 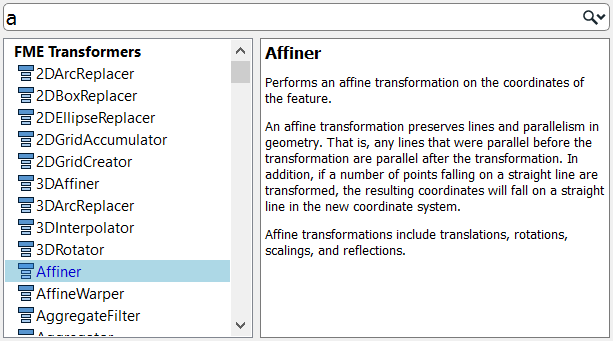 Press Return again to immediately open the Transformer Parameters dialog. Tip: Typing a sequence of letters can also identify objects whose names have those letters capitalized. 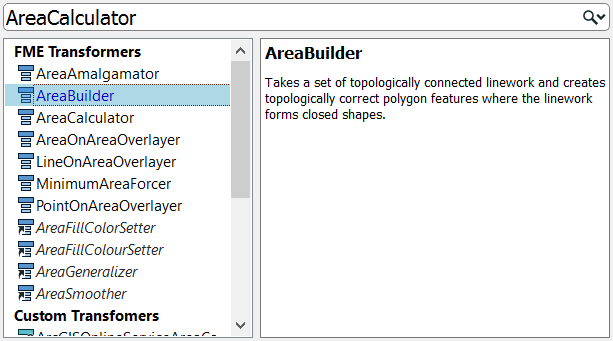 For example, to find the GeometryPropertySetter transformer, type gps. 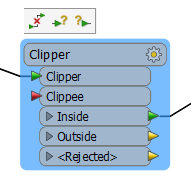 Click Tools > FME Options> Workbench. Under General, make sure that Automatically connect after Quick Add is enabled. 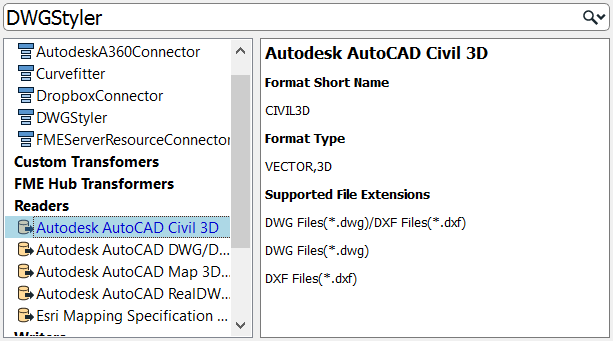 If you select another object before initiating the Quick Add search for a transformer, it will connect automatically to the object. Upon auto-connecting a transformer, a connection toolbar appears above the transformer . If you wish to remove connections while keeping the transformer on the canvas, click Undo Automatic Connection . To undo, add, or change input port connections, click Reconnect input port . To undo, add, or change output port connections, click Reconnect output port . The connection toolbar disappears when focus shifts away from the transformer. Tip: If you add a transformer, then want to add the same transformer again, press the slash "/" key on your keyboard. The Quick Add box will appear showing the last selected transformer. Press the Return key to include it, then press Return again to edit its parameters.